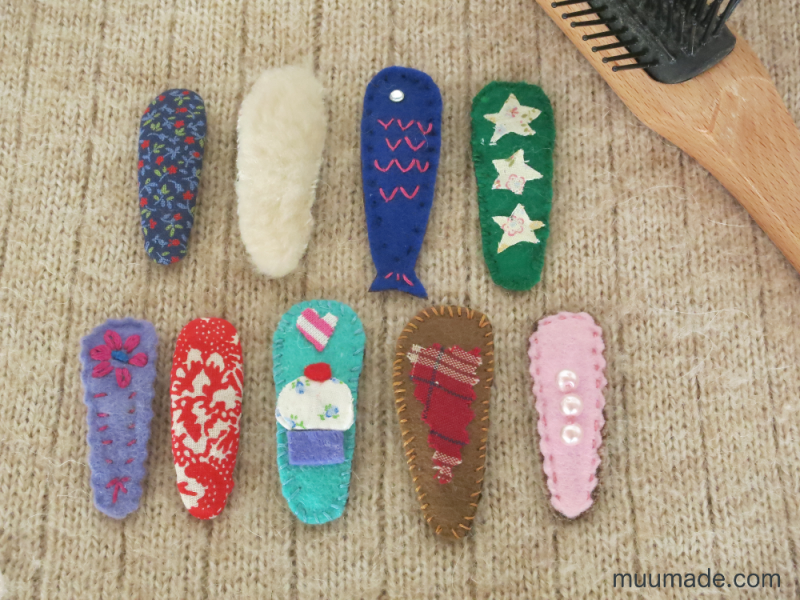 Redecorating hair clips is a simple and fun sewing project for children and grownups alike. If you have hair clips with chipped paint or broken decorations, this is a great way to renew them. 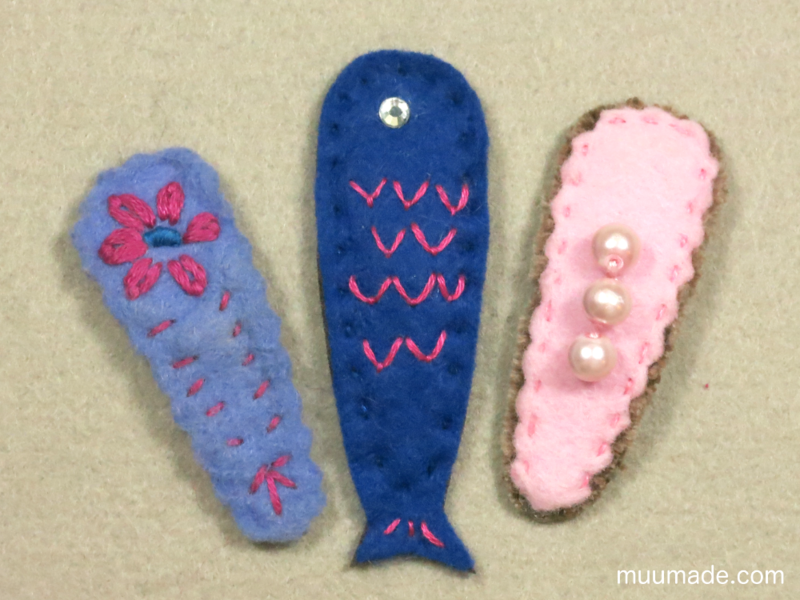 In addition, the fact that the finished barrettes are wearable is a big motivational factor for young crafters! As long as the old hair clips are still sturdy, they can be used for this project. 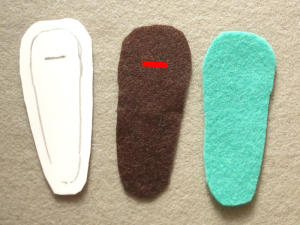 The outward appearance of the clips does not matter as they will be covered in felt. More embroidery thread, if you want to sew on your decorations. 1. 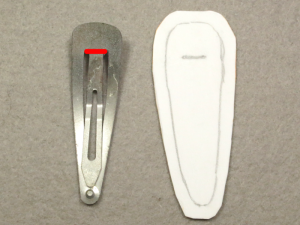 Trace the outline of the hair clip onto a piece of paper. Then, make another outline that is approximately 2-3 mm (1/16″-1/8″) larger than the first. Cut along the larger outline to make a paper pattern, as shown in the photo. Also, draw a short line on the paper pattern to mark the end of the center part of the clip (the section marked in red in the photo). 2. 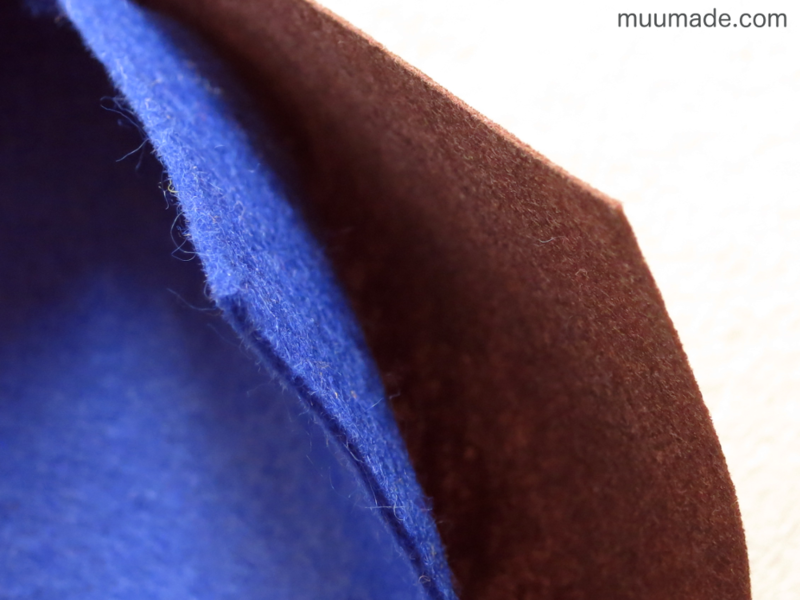 Trace the paper pattern onto the thin felt and cut it out (the dark brown piece in the photo). 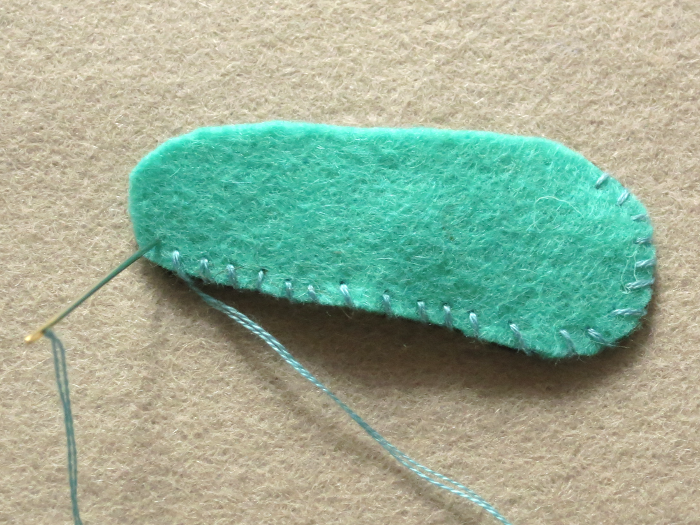 Cut another piece from the thick felt (the mint green piece in the photo). Remember to make a small horizontal cut (marked in red in the photo) ONLY on the thin piece of felt. 3. 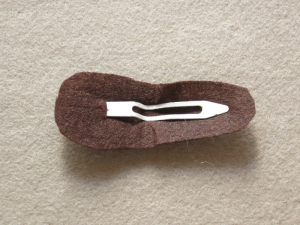 Push the central part of the hair clip through the small hole that you just made on the thin piece of felt. 4. 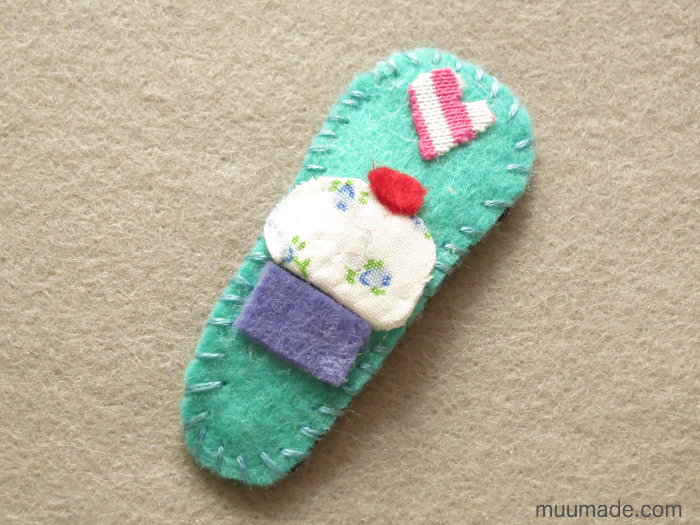 (Optional) If you want to sew on some decorations, now is the time! You can sew on beads, sequins and felt pieces, and/or embroider a design onto the thick felt piece. Note: If your decoration is not symmetrical, make sure to orient the design so that it will face the right direction when the hair clip is worn. 5. Place the thick felt piece on top of the hair clip, aligning it with the thin felt. Then, using the Whip Stitch, sew around the edge. 6. (Optional) If you wish, glue some decorations onto the outside of your hair pin. You can use any small and relatively flat pieces for this purpose, such as rhinestones, sequins, and felt and/or fabric pieces. Ta-da! 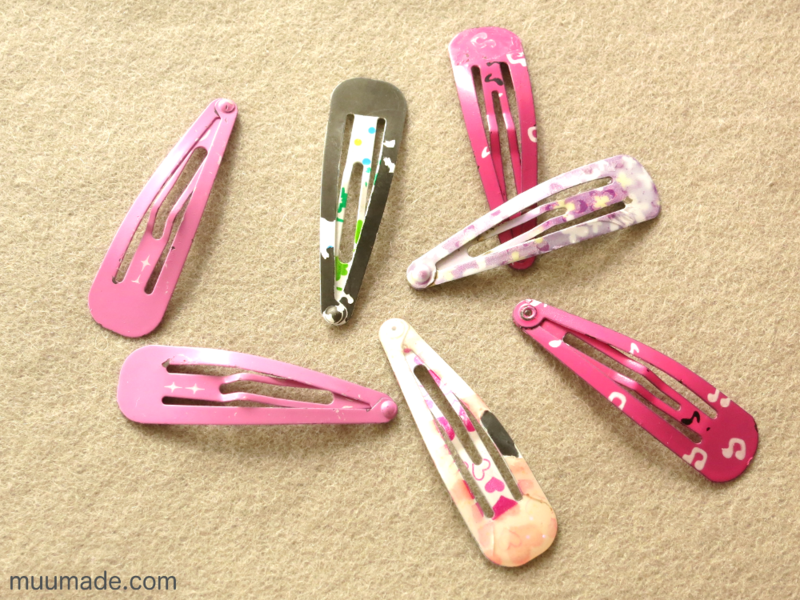 Your snap clip has been transformed into a new one-of-a-kind hair clip! 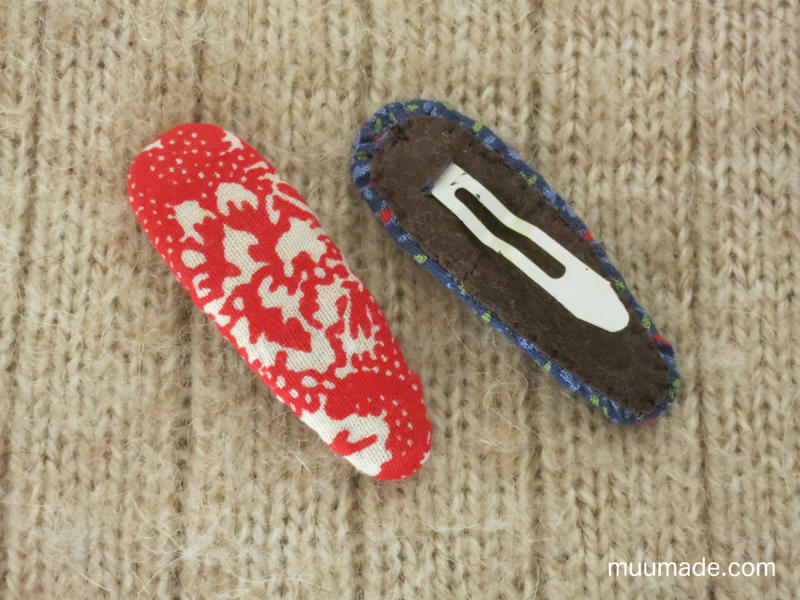 As shown above, I also made a few fabric covered clips. Here is the set of instructions that I found useful for making this type of clip. Lastly, here is a link with more hair clip decoration ideas to get your imagination going. Feel free to share the images of your renewed hair clips in Muumade’s Gallery, or make sure to include #muumade if you are posting them in social media.